Few simple pleasures compare to sitting by the window during a spring rainstorm with a bowl of steaming soup and perhaps a chunk of crusty bread for dipping. Here in Colorado, however, most of our "rain" this time of year is white and fluffy. Still, I'm drawn to the window, and I love to indulge in soup while I'm watching the snow fall. Last week we had several days of wet, snowy spring weather and I couldn't help but satiate my craving for soup. I'd picked up some fresh, ruby beets from the market a few days earlier, and they seem to be just waiting to be roasted and turned into a warm and aromatic soup. So, after a harrowing drive on icy roads that morning to drop my son off at school, there was nothing more soothing than roasting beets in the oven until sweet and fragrant. 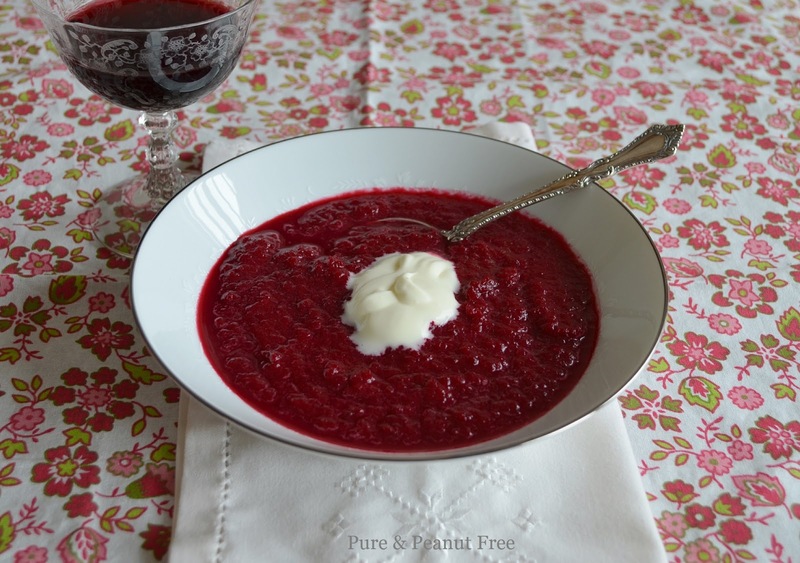 Then I simmered them with apples and puréed it into a comforting Roasted Beet and Apple Soup, topped with a rich dollop of crème fraîche. A sure cure for my frayed nerves. 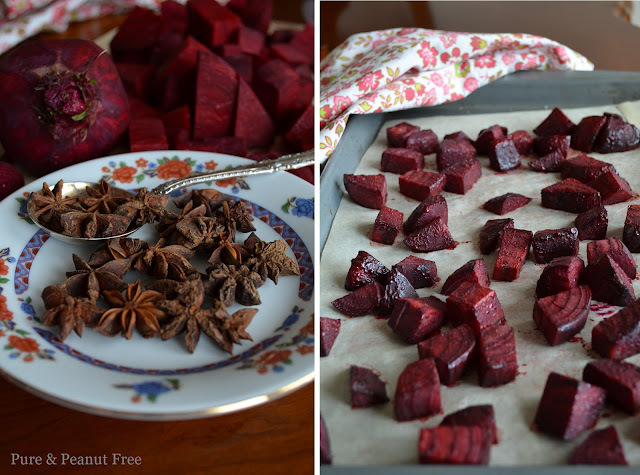 Most recipes call for roasting the beets in their skins. I, however, find it much easier (and cleaner) to peel the beets with a vegetable peeler before cooking. By roasting them first, until the sugars begin to caramelize, you add a dimension of flavor that you just can't get by simply boiling them with the apples. Of course, if you're in a hurry you could certainly skip this step, but the flavor just won't be the same. To complement the sweetness in this soup I add one whole star anise, which I remove just before blending. It adds a hint of spicy warmth that pairs so very well with the beets and apples. The snow began to melt early that afternoon, and by evening the sun was peaking out from behind the clouds. A warm breeze was blowing and the air smelled fresh, moist and clean. 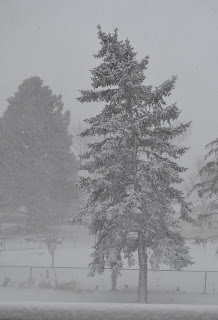 A typical spring day here in the mountains of Colorado. Snow is in the forecast again for Wednesday, and I'm thoroughly looking forward to making this soup once more. I hope it brings as much warmth to your rainy (or snowy) spring days as it does to mine. Preheat your oven to 400 F (200 C). Line a baking sheet with parchment paper. 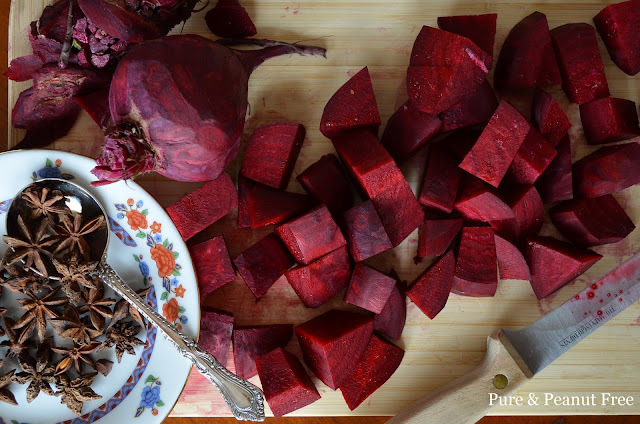 Toss the peeled, cubed beets with 2 tsp of olive oil and a pinch of salt and pepper. Spread evenly on the baking sheet. Roast for 25 to 30 minutes until fragrant and slightly caramelized. Meanwhile heat 2 tsp of olive oil in a large sauce pan over medium heat. Sauté the shallots in the oil until soft. Stir in the apple cubes, salt, pepper, and star anise. Continue to cook for a minute or two longer, until you can smell the star anise. Add the water and cooked beets to the pot. 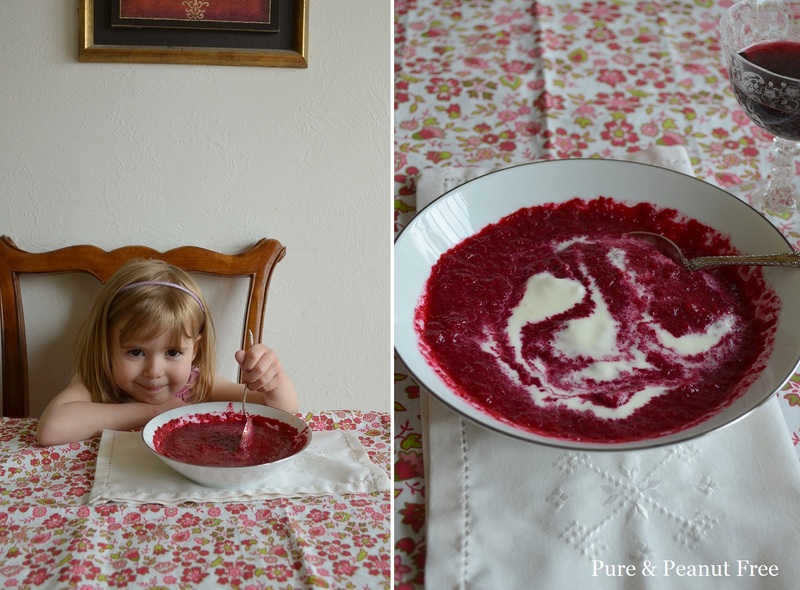 Cover and simmer for 10 - 15 minutes, until the apples and beets are very soft. Remove from the heat and add the balsamic vinegar. Remove the star anise pod. Transfer the soup to a blender and purée just until mixed (I like mine a little chunky). (Alternately, you could run the soup through the fine blade of a food mill, for a more uniform texture.) Pour the soup into bowls and top each serving with 1 tablespoon of crème fraîche. Serves 4.